Free Hex Editor Neo is the fastest freeware binary file editor for Windows platform. Neo Hex Editor data processing algorithms are extremely optimized and carefully tuned to handle operations with large files in just seconds. Here is common Free Hex Editor Neo usage scenario with searching and replacing patterns in 1 GB file: lengthy operations performs smoothly, UI stays responsive, progress bars provide you with frequently updated information, system always has sufficient resources, all your modifications are stored safely and instantly ready for Undo/Redo. Product development history since year 1999 makes this binary file editing software just true champion of performance and stability. Hex Editor Neo provides you with basic, advanced and even innovative editing functionality. Hex editing now made easy! Download Free Hex Editor Now and try it yourself. Optimized for manipulating large files. Neo operates with huge files (filesize over 1GB) in just seconds. Sharing edited files with other applications, changes highlighting using simple and diff algorithms. Open and edit Intel HEX and Motorola S-Records. Built-in 8-bit, 16-bit, 32-bit Intel HEX editor and Motorola S19, S28, S37 editor. Open and modify volumes and physical disks: read, view, edit and write RAW data of partition tables, MBR, tracks and sectors. 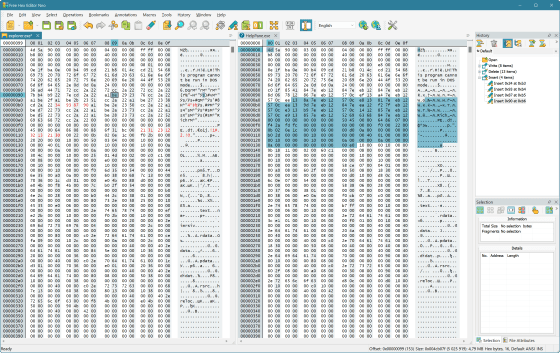 HDD editor supports read-only mode (switches Neo to be just Hex Viewer) for safe data analyzing, disc editor supports NTFS and FAT FAT32 file systems. When hex edit bin file with Neo, just press "Create Patch" button and get x86 or x64 patch file ready. View and edit data as: Binary, Hex, Decimal, Octal, Float, Double. Read hex file and group data by: Bytes, Words, Double Words, Quad Words. File offset may be displayed as: Hex, Decimal, Octal. Little endian and Big endian byte order is also supported by our hex data viewer. Our text data editing software supports the following txt encodings: ASCII, ANSI, UNICODE UTF-16, UTF-8, OEM, ISO, IBM EBCDIC, ISCII, MAC, Asian, Arabic, KOI8-R, KOI8-U and more... Left part of the document window provides you with hex codes, Right part of the document window works as hex decoder, it converts hex bytes to the string of characters. Neo hexedit utility allows you to search for the patterns in following data types: Text string, Unicode string, Hex, Decimal/Integer Value, Octal, Binary, Float, Double and even Regular Expression. All result entries may be replaced with custom patterns. Replace also supports RegEx patterns for advanced hexadecimal editing. Find/Replace supports Ignore/Match Case option. You may use hex editor program for advanced binary files search: Neo Find and Replace tool supports searching for pattern occurrences in files, folders, drives and even NTFS streams. Neo provides you with fastest data search engine available on the market today, it performs search and replace function in big files (~1GB size) in just seconds! Unlimited Undo/Redo with visual changes history representation and support for fast switching between multiple document revisions/editions. Goto Offset, Advanced customizable bookmarks with Save/Load, Import/Export functionality and grouping. Neo allows you to use clipboard functionality: Cut, Copy, Paste, Delete, Insert, Import and Export binary hexadecimal data. Overwrite and insert mode supported. Bitedit tool provides you with UI for easy bit fields modification. Bit editor also displays bit field as Hex, Decimal, Octal and Binary value. Binary data may be processed using the following Bit Operations: Bitwise NOT, OR, AND, XOR, Arithmetic Operations, Rotate, Logical and Arithmetic Shift operations, Lower Case, Upper Case, Reverse Bits, Byte Swap operations. Built-in hex decoder encoder allows you to encode and decode binary file and hex data using RSA RC2, RC4, DES, Two-key triple DES, Three-key triple DES, Advanced Encryption Standard and CYLINK encryption algorithms. Neo binary files editor also supports the following encoded data processings: Base64-encode, UU-encode, Quoted printable, Intel HEX and Motorola S Records. Binary data analysis module allows you to analyze bytes, characters and strings distribution across hex dumps and text data. Neo binary file analyzer supports patterns of the following types: ASCII / Unicode chars and strings, Hex, Decimal, Octal, Binary, Float, Double and RegEx (Regular Expression) data patterns. There is graphical representation for the analyzed data in the Neo user interface. It supports heatmap and histogram data visualization. You may also analyze binary file in the form of descriptive statistics: Mean, Sample Variance, Standard Deviation, Standard Error, Kurtosis, Skewness, Median, Range, Min, Max, Sum, Mode(s) is calculated for each analyzed data pattern. Neo provides you with advanced hex compare tool - app for comparing 2 binary files in Windows OS. Built-in hex diff tool allows you to compare 2 hex files using two different file comparison algorithms: simple algorithm (byte to byte) and difference algorithm (block matching). Neo memory and process modifier allows you to directly edit memory and process data loaded into the PC RAM by Windows operating system. RAM explorer provides you with ability to easily browse loaded processes and navigate to specific offsets. You may then directly access these data blocks and edit them into the hex editor window. So Hex Editor Neo provides you with ability to view and edit exe programs bin data directly in the RAM. Hex Editor Neo is not just a simple raw exe code editor, it also allows you to disassemble x86, x64 and .NET executable files. Neo Assembler View supports the following instruction sets: x86, x86-64, MMX, SSE, SSE2, 3DNow!, MSIL. You can load symbol files for both 32-bit and 64-bit executables. Neo is just a perfect dll/exe editor! Neo binary files editor supports parsing internal structure of the following files: exe, dll, sys, ocx, bmp, png, avi, rar, icc, vhd, zip, tiff, wav, tga, psd, pic, pcx, pal, emf, eps, cab. Understanding hexidecimal data. Structure View module allows you to customize your binary templates. You may write your custom file structure definition using internal C/C++ like language for almost any binary file format. For example, if you want to edit dat files, you need to describe file structure first and then bind it to the specific file using Structure View toolwindow. File structure parser makes binary editing much easier than just editing raw hex bytes. Structure Viewer module makes Hex Editor Neo more than just another bin file editor. Open, view and edit hex/bin files with ease! Multilingual UI with support for the following languages: English, German, French, Italian, Spanish, Danish, Polish, Chinese (Simplified), Russian, Ukrainian, Indonesian. * Free Hex Editor Neo is distributed as "Freemium" software application. Some of the functionality above may be available only in paid version of the product, but you may always try it for free during 14 days. Hex Editor Neo is just an invaluable toolkit for comfortable reading hexadecimal dumps of binary encoded data. File structure learning for beginner programmers. Custom file structure parsing feature makes binary file editing easy to understand. There are several articles in the internet describing gamers were able to successfully transfer (from one device to another) game progress and game save with help of Hex Editor. Hex Editor Neo is a handy tool for computer forensic analysts and investigators. It helps digital forensics specialists to analyze disk images, perform in-depth analysis of file systems and more. Free Hex Editor Neo is just more than another hxd editor. Today it's simply fastest and most powerful hex programming solution available at no cost. Simply download Free Hex Editor Neo and enjoy new level of binary file editing for free. Download Free Hex Editor Neo and complete your tasks in just seconds! Efficient It supports multiple core processing and utilizes full power of your CPU. Smart It supports complicated regular expression search patterns. Handy It allows you to make patches in just one click. Flexible It allows you to tune every aspect of user interface. Inexpensive It costs you NOTHING!